SOLD - PAINTINGS NO LONGER AVAILABLE. 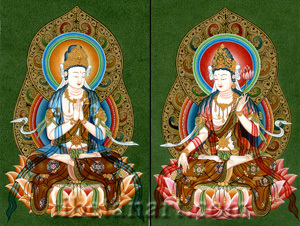 This pair of paintings depicts Kuan Yin and Avalokiteshvara seated and facing each other. Both deities sit upon the seed-heads of open pink lotuses, with Kuan Yin seated in lotus-posture and Avalokiteshvara seated in vajra-posture. They are peaceful and radiant white in colour, and both wear lower garments of embroidered silks, a silk sash draped across their left shoulders, and billowing silk ribbons that adorn their crowns and armlets. And both wear a long diaphanous silk scarf that flows about their shoulders and arms, with Kuan Yin wearing a blue scarf and Avalokiteshvara wearing a red one. They are adorned with gold bracelets, armlets and chokers, with jewels and threaded bodhi-seeds ornamenting their longer necklaces. Their blue-black hair is piled up into topknots with loose strands hanging about their shoulders, with Kuan Yin bearing the emblem of a water-pot on her golden crown, and Avalokiteshvara bearing the small image of red Amitabha Buddha on his golden crown. Kuan Yin has her two hands palms-folded in anjali-mudra in front of her heart. Avalokiteshvara holds aloft the stem of a red lotus in his left hand, while with his lowered right hand he makes the boon-granting gesture of supreme generosity. Both of their auras are decorated with inner rings of lotus petal designs, while their outer auras and halos are decorating with scrolling jewel patterns.